Popular press for the paper by O'Leary et al. (2013) in Science describing the results of a supermatrix for mammals and mammal evolution across the Cretaceous-Paleogene Boundary. A significant part of the activities in my lab is devoted to developing new software and computer infrastructure for building the history of life (phylogenetic tree-building) using morphological (phenomic) data. Whether researchers are building trees with morphology or combining morphology with genes in a supermatrix, it has been important to modernize the tools used everyday by scientists worldwide in this endeavor. My lab has developed the web application and database, MorphoBank, that allows teams of researchers anywhere in the world to collect and share primary data for phylogenetic tree-building in real time. An example of how MorphoBank was applied to scientific hypothesis testing was the National Science Foudation's Assembling theTree of Life for Mammals project in which over 20 researchers worldwide collaborated during a five year period to create a supermatrix of more than 4,000 anatomical features of living and fossil mammals (figure at right). I have also contributed to papers and conferences on best practices in phylogenetics, systematic methodology using morphology, and the importance of databasing the primary information generated in systematics research, including matrices. 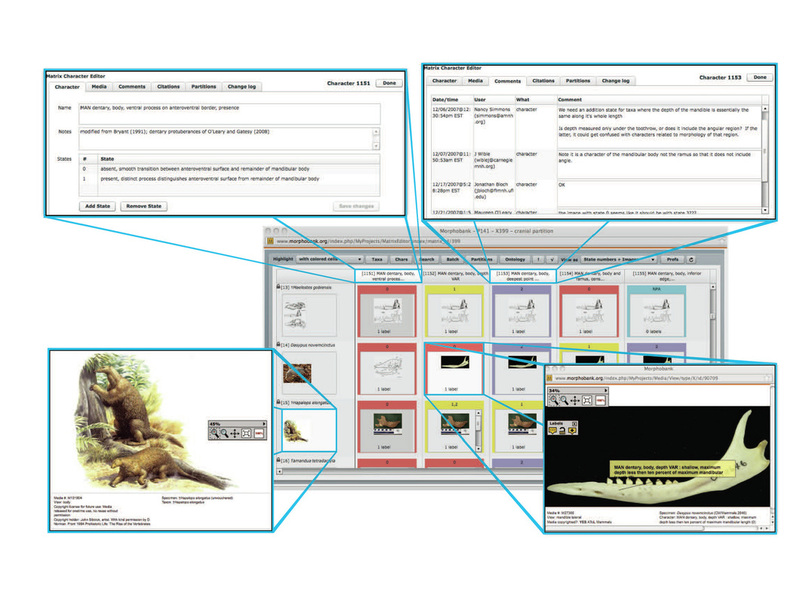 The image below shows the dynamic nature of the MorphoBank web application as a platform for the integration of key metadata such as images, references, notes and activity related to scientific research. You can read more about MorphoBank here. Support for MorphoBank has come from the National Science Foundation's Division of Earth Science and Division of Environmental Biology, as well as from the National Evolutionary Synthesis Center, Stony Brook University and the American Museum of Natural History.